The GX2200E by STANDARD HORIZON is the first compact Class D DSC radio system with integrated GPS and AIS receiver. It features an embedded 66-channel GPS receiver and an integrated splitter for use of VHF and AIS receivers with a single FM antenna. € 439,95 Inc. tax, ex. shipping. The GX2200 by STANDARD HORIZON is the first compact Class D DSC radio system with integrated GPS and AIS receiver. The integrated 66-channel GPS antenna provides a reliable reception of the GPS position.The received GPS data can be used via the NMEA 0183 interface. 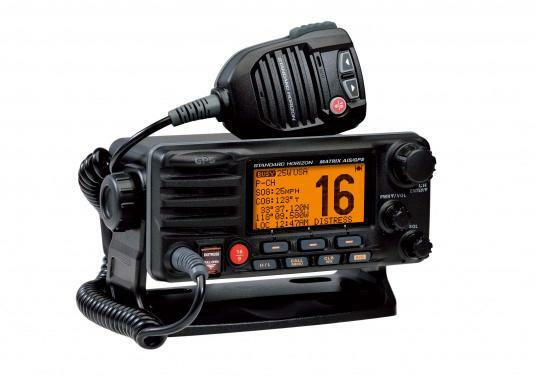 The built-in VHF splitter allows the VHF and AIS receiver with only a single FM antenna. The large 1.8 "LCD screen of the GX2200 displays all received AIS targets clearly. This allows the user not only the identification of the other ships of the received MMSI, but also the determination of each course of the target. The display will also tell you instantly about the MMSI number, call sign, ship name, bearing, distance, speed over ground and course over ground of the selected target. Furthermore an alarm can be activated in case of dangerous approach (CPA alarm adjustable). For fast and accurate communication, an automatic DSC-call can be sent to a selected AIS target. The big advantage is that you do not have to enter the 9-digit MMSI number of the selected ship. It is sufficient to select the target on the AIS screen, then press the call button. Of course you can connect your existing plotter via NMEA connection to the radio, so AIS targets are sent to the plotter (please note that your plotter needs to support the AIS function for this). In addition the GX2200 offers the possibility to switch the baud rate of the GPS input and DSC / AIS output. This is very useful in particular if your plotter has only one NMEA 0183 port. Due to its integrated GPS antenna, the GX2200 is a highly useful navigational aid and up to 100 waypoints can be stored. These waypoints can be selected and controlled with the help of the compass display. In case a pressure chamber loudspeaker is connected, the device can also be used as a counter / intercom. A full-fledged second operator unit (CMP30) can be connected to the GX2200 radio. This waterproof handset is ideal for mounting on the outside steering position, at the tiller or cockpit. If a second control device is connected even an intercom function is possible. You can thus make "calls" between the devices. The DSC or ATIS function/menu is only available in the respective channel group. Please change to the corresponding channel group to use the respective functions. This device has to be programmed with your personal data, such as MMSI and/or ATIS numbers. You may carry out programming of MMSI and ATIS numbers yourself. Relevant instructions can be found in the manual. As an alternative, we can carry out programming for a programming fee. If you would like us to program your device, please let us know with your order. Furthermore, please enter your MMSI / ATIS number in the 'comment' field during your order or fill out our datasheet for programming VHF radios and send it to: datenblatt@svb.de. If additional channels (e.g. dutch channels 30, 31 and 37) are to be programmed, we charge a programming fee. The fee is only charged once per device. The application for MMSI and ATIS numbers can be found under Service/Downloads. 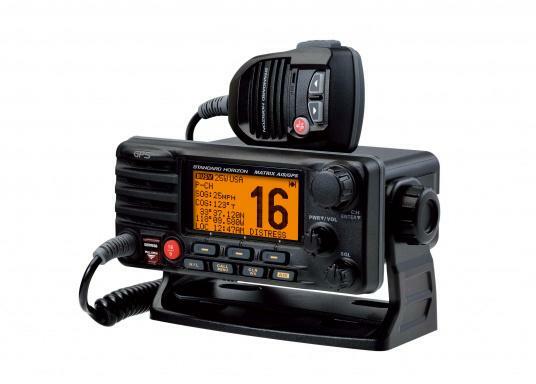 la VHF standard standard horizon gx 2200E est elle compatible avec un traceur garmin écho map 72 pour afficher les cibles AIS sur le traceur ? Werden die eigenen AIS-Daten auch gesendet, so dass die Berufsschifffahrt z.B. einem auf dem Schirm haben, oder kann nur empfangen werden? Nein, das Gerät hat nur einen AIS Empfänger. Wenn Sie die eigene Kennung senden wollen, benötigen Sie zusätzlich einen AIS Transponder. è omologato per ANFR in Francia? 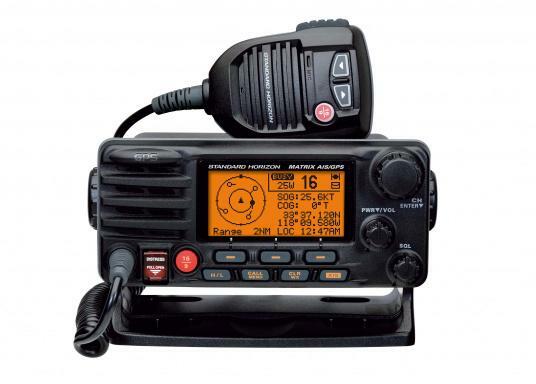 STANDARD HORIZON UKW GX2200E its is good for malta europe ? Bonjour, le mmsi est lié au bateau. Deux solutions, soit laisser la radio sur le bateau soit effectivement renvoyer la vhf en usine pour changer le mmsi et le remplacer’ par le mmsi du nouveau bateau. C’est impossible de le changer soi même. good day i am looking at purahcsing this item, however how do i best communicate the programmable data and the channels i would like to have added in my order? omologazione per ANFR Francia ...esiste? Telefonische Bestellung lief freundlich und professionell. Der niedrigere Preis beim Mitbewerber wurde weitergegeben. Im Laufe der Zeit habe ich schon viele Funkgeräte genutzt. Das GX2200E übertrugt alle Erwartungen, sehr gute Ausstatung und Bedienung, 1A Verarbeitung zum sehr guten Preis Leistungsverhältnis. Das ist meine Empfehlung an alle. le produit est connu, et il n'a pas de concurrent à ce tarif. bestes Upgrade an Bord meines Segelboots, die AIS-Darstellung ist bei mir die Standardansicht, Range und Annäherungsalarm lässt sich schnell und ohne Anleitung anpassen, damit im dichten Verkehr nicht ständig der Alarm angeht und man auf dem Display nicht den Überblick verliert, Strasse von Messina war nachts kein Problem, obwohl die Positionslichter der Schiffe nicht zu erkennen sind wegen der Hintergrundlichter. Es war mit dem Funkgerät kein Problem die Schatten der Schiffe zu erkennen, weil man wusste wo man suchen muss. Dazu die AIS-Infos über die Schiffe wie Geschwindigkeit, Entfernung, Kurs. Der Alarm ist so laut, dass man auch aus einem Erschöpfungsschlaf bei der Nachtwache und bei laufendem Motor aufwacht. Auf der Adria hatten alle Boote nachts AIS-Sender. Thyrenisches Meer hatten in Küstennähe einige Fischer das AIS aus, was sie dann aber plötzlich angestellt haben. Anschluss und Bedienung ohne Handbuch möglich. Komme nur nicht in das DSC Menü und habe noch nichts dazu im Handbuch gefunden. MMSI Eingabe ist sehr einfach. VHF-Empfang scheint mir wirklich gut.